I am a fifth-year Ph.D. candidate in the Department of History. My work explores the transnational activism of African Americans in the black freedom struggle. I highlight the day-to-day work of movement building across national borders with an emphasis on the difficulty of transcending beyond rhetorical invocations of black internationalism. My current project focuses on the lived experience of African American expatriates to explore how they formed strategies for survival to meet the local circumstances of their expatriation. International connections formed an integral component of the Black Power era, yet many activists struggled to forge lasting, transnational coalitions due to the variable politics of the Cold War. African American political exiles, wholly dependent on the goodwill of their hosts, most plainly bore the weight of shifts in international support for the black freedom struggle. 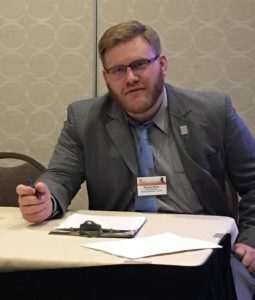 My dissertation, directed by Dr. Pero G. Dagbovie, is entitled “Too Western in My Approach to Tyranny’: Black Internationalism and Robert F. Williams’ Activist Network in the Cold War, 1950-1976.” This work further builds on the connections between the Civil Rights—Black Power Movement and the politics of the Cold War. My analysis focuses on how black international activists responded and adapted to the shifting political realities of the Cold War. 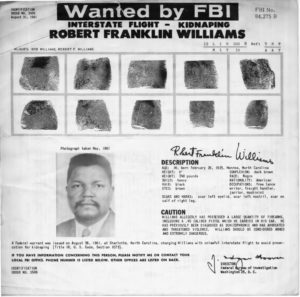 Using Robert F. Williams’ life and thought as a nucleus, I examine how an activist network weathered the domestic and international pressures of the 1960s. This cohort includes Williams, his wife Mabel Robinson Williams, journalists Julian Mayfield and Richard Gibson, activists such as Mae Mallory, the lawyer Conrad J. Lynn, and others. The project starts in the 1950s in order to establish the initial impact of the Cold War on African American international activists and ends in the 1970s in order to track the influence of détente on black internationalism. This period reveals the ways in which Cold War politics remained enmeshed with the Civil Rights—Black Power Movement.